Geneva - On 26 February 2018, lawyers from Ireland approached the Ministry of the Interior in the United Arab Emirates (UAE) to try to gain access to distinguished human rights defender Ahmed Mansoor, who has been detained since 20 March 2017 for his human rights activities. Mansoor, who received the Martin Ennals Award for Human Rights Defenders in 2015, is a member of the advisory board of the Gulf Centre for Human Rights (GCHR). 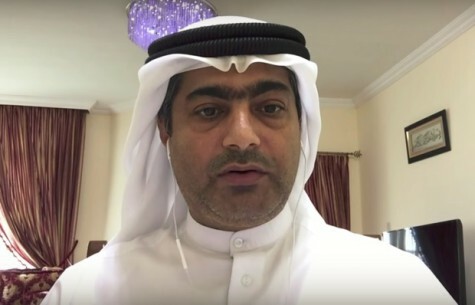 Several hours after his arrest, the official state-run news website, the Emirates News Agency, announced that Mansoor was arrested on the orders of the Public Prosecutor for Cybercrimes linked to his social media posts. Eleven months later, it is unclear what, if any, charges he is facing, whether court proceedings are underway, and if he has legal representation. Furthermore, his place of detention is unknown, and there is no information on how he is being treated, or whether he is in solitary confinement. With the exception of two family visits on 3 April and 17 September 2017, it appears that Mansoor has had no other visitors. Ensure he is granted immediate and regular access to a lawyer of his choosing, his family, and adequate medical care. Ahmed Mansoor was arrested by a dozen security officers at his home in Ajman in the pre-dawn hours of 20 March 2017 and taken to an undisclosed location. The security officials conducted an extensive search of his home and took away all of the family’s mobile phones and laptops, including those belonging to his young children. The family had no information about Mansoor until a statement was issued on the Ministry of Foreign Affairs website on 29 March 2017 saying that he was in detention in the Central Prison in Abu Dhabi. Since his arrest, his family were allowed to visit him only twice - on 3 April and 17 September 2017, and he has had no access to a lawyer. In the weeks leading up to his arrest, Mansoor had used Twitter to call for the release of activist Osama Al-Najjar, who remains in prison, despite having completed a three-year prison sentence in 2017 on charges related to his peaceful activities on Twitter; as well as prominent academic and economist Dr. Nasser bin Ghaith, arrested in August 2015 and sentenced to 10 years in 2017. Both men have been convicted of charges related to peaceful messages they posted on the social media platform Twitter. Mansoor had also used his Twitter account to draw attention to human rights violations across the region, including in Egypt and Yemen. He had also signed a joint letter with other activists in the region calling on leaders at the Arab Summit who met in Jordan in March 2017 to release political prisoners in their countries. UAE hacks the Apple IOS system to try to spy on Mansoor. Mansoor, along with Dr. Nasser bin Ghaith, and online activists Fahad Salim Dalk, Ahmed Abdul-Khaleq, and Hassan Ali Al-Khamis were arrested in April 2011 and charged with “publicly insulting” UAE rulers. On 27 November 2011, a panel of four judges of the Federal Court found all five men guilty and sentenced Mansoor to three years in prison, and the others to two years. The five men were released the next day, after the UAE president, Sheikh Khalifa bin Zayed Al-Nahyan, issued a pardon.